Acar is a type of pickling made in Indonesia, Malaysia, and Singapore. It is made from different vegetables such as yardlong beans, carrots and cabbage which are pickled in vinegar and driedchillies. The vegetables are then tossed in ground peanuts. Variants of acar include acar awak or Nyonya acar, and Malay acar. Acar awak is more elaborate, containing other vegetables such as eggplants as well as aromatic spices in the pickling mix. Acar is commonly served as a condiment to be eaten with a main course. 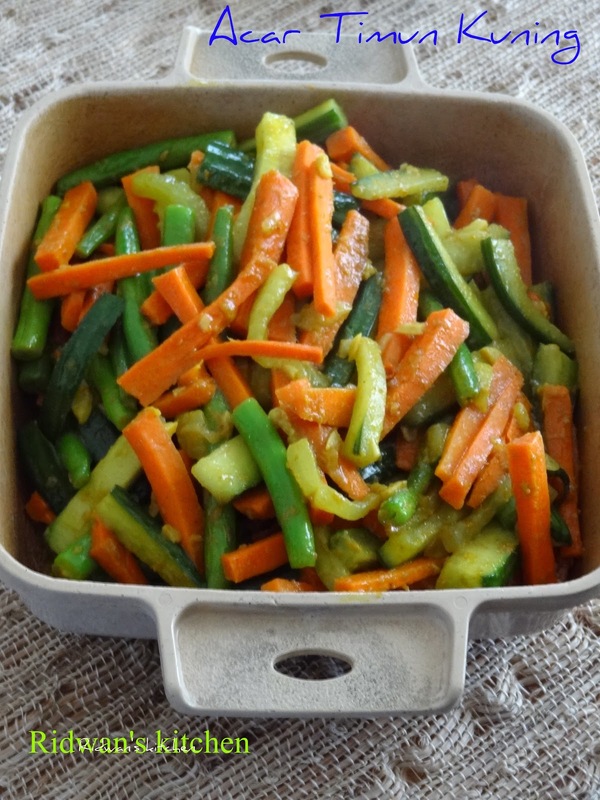 In Indonesia, acar is commonly made from small chunks of cucumber, carrot, shallot and occasionally pineapple, and marinated in a sweet and sour solution of sugar and vinegar. Some households add lemongrass or ginger to spice it up. The salad has also been adopted in to Thai cuisine where it is called achat (Thai: อาจาด). It is made with cucumber, red chillies, red onions or shallots, vinegar, sugar and salt. It is served as a side dish with the Thai version of satay(Thai: สะเต๊ะ). in west java ( Indonesia ) where I come from, acar can be cook too,we call it "tumis" cook in few minutes until all ingredients combine and the vegetable still looks fresh not really soft or mushy. cook chopped garlic and shallot until cook about 2-3 minutes add grated ginger and galangal cook for a while. add carrot,green bean and cucumber,and season with dry ingredients,salt,pepper,curry powder,turmeric powder and sugar. cook about few minutes until green bean soft not too cook. So appetizing and delicious! Exactly what I would love now. Oooh, I like the sound of this, Ridwan! Yum! This looks really tasty! I think it would be a great side/salad with just about everything...even burgers! Looks tasty and healthy. I would eat this. Thanks for sharing another great recipe.